The original and trusted Rotoflex range from Theraposture is the widest and most diverse available. Each highly sophisticated and reliable rotational bed provides the ultimate assistive solution for disabled users so they get in and out of bed independently. Through precision German engineering its electrically powered variable height, profiling and rotating mechanisms move a user from a recumbent to an upright seated position. The Rotoflex ensures a standing transfer can be achieved more safely for a semi-ambulant user without the need for carer invention. 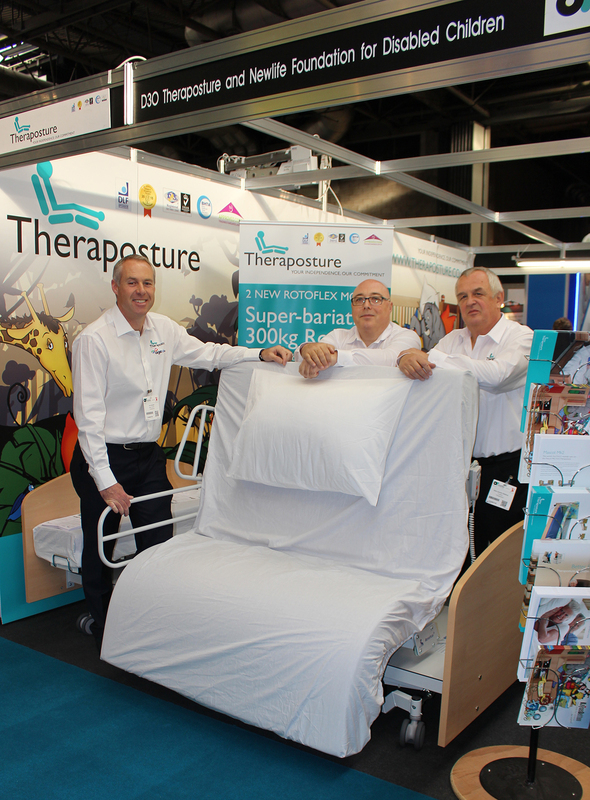 To extend the Rotoflex’s scope of suitability, Theraposture was delighted to launch two new versions at the OT Show – a Super-bariatric and a Low Access version. Theraposture has supplied a 230kg SWL (Safe Working Load) bariatric Rotoflex since 2011 suitable for users weighing up to 190kg. However in response to a need from larger clients, this leading specialist has introduced an extra heavy-duty version that has a 300kg SWL. This Super-bariatric Rotoflex is now the highest user weight capacity turning bed available as it can comfortably support a user weighing up to 245kg. Alongside the Super-bariatric Rotoflex, the new Low Access version also delivered a show highlight as it now represents the lowest rotating bed available today. Based on Theraposture’s original and proven design, the new Low Access Rotoflex provides an ultra-low sleeping surface and powered rotational assistance ideal for smaller users and those requiring a lower seat height. Its variable height functionality is particularly beneficial as it allows the sleeping platform to be raised from 32cm to 82cm above floor level. This means, similar to all Theraposture beds, it fully meets BSEN60601-2-52 regarding safe working heights, along with an ability to avoid any risk of entrapment.